The MX200-TTX is an interface converter deployed at the edge of a G703 E1/T1 line or network providing a point-to-point interconnection for voice with an E1/T1, LAN with a powerful 10/100BaseT bridge and miscellaneous applications with an RS-232 port. Users can select without restriction any TS of the link with cross-connect capability on the D&I port. The Ethernet bridge of the MX200-TTX is manageable, can be pinged over the LAN and is VLAN transparent. When a limited number of TS are allocated for the Ethernet transport, the Ethernet bridge can filter the traffic and compress the Ethernet frames. The MX200-TTX can utilize framed or unframed links over n E1/n T1/PDH/SDH networks. These are single point-to-point links over DSL, FO or microwave. A basic multiservice application for the MX200-TTX is to connect two sites over a G703 network and providing voice circuits to a PBX, a LAN connection and remote control of RS-232 devices. The MX200-TTX can also be daisy chained together to distribute applications like IP-Video or at the edge of n E1/ n T1 PDH network. The MX200-TTX is compatible with the CXR IX4200 and QX3440 to concentrate and interconnect site for voice, LAN and serial applications. 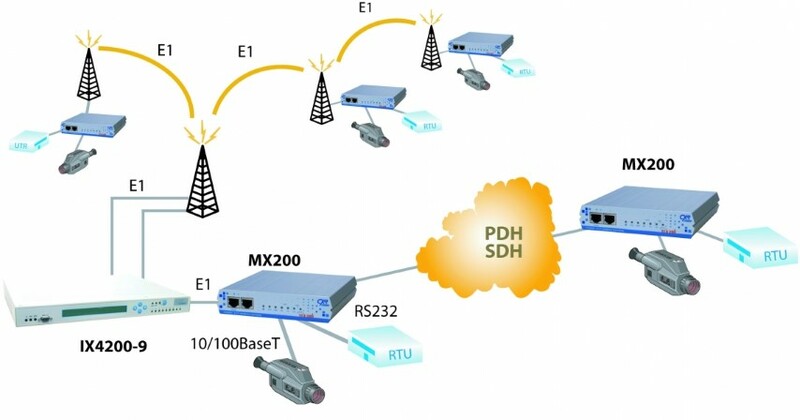 MX200TTX and CV200-TTX support different HDLC and PPP WAN protocols and are compatible with many third party equipment.